Hello! It's time for a brand new Mojo Monday sketch (#258). Julee has a fabulous sketch for us to play with! I used one of the fun sentiments from the new Doodled Occasions on my card today. I added one big banner instead of the smaller two on the sketch. I used the Ribbon Banner die to cut a banner out of burlap to add some texture. Accessories: A Cut Above Dies: Ribbon Banner (Verve), Standard Circle and Scalloped Circle Nestabilities (Spellbinders), Markers (Copic), Buttons, Hemp cord, Crochet cotton, Burlap, Distressing Tool, Foam tape, Thread, Sewing machine. Very pretty. Love the burlap banner. Stephanie, this is such a stunning pieced BG! Also love the burlap banner element! Gorgeous card! Terrific card! I love the sentiment and your button accents. Thanks for the wonderful inspiration. Wowza, girl!! That Starburst BG is amazing!! Love the burlap too. Great take on the sketch!! Great card, love the shabby. Stephanie, this is fabulous!! I love the stitching and the burlap. Really sweet. LOVE! I'm loving the stitching and the buttons. So Cute! Oh, I'm just in LOVE with that stitched background! So fabulous! Gorgeous card, Steph. What a fun card Stephanie! Love the fancy stitching! Awesome card! Love the rays of d.p. as a background. How did you do it??? Love this! Your sentiment and the burlap...just fabulous! 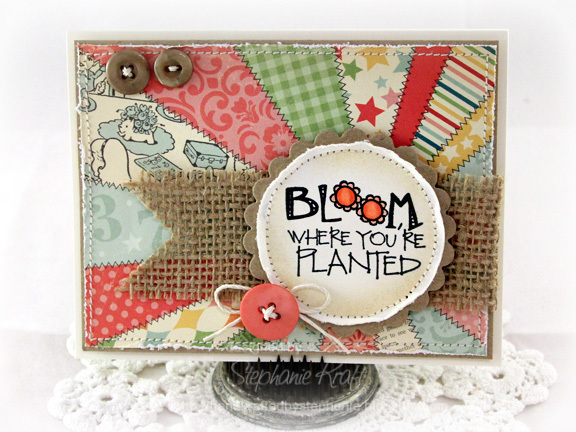 Wonderful sewn background and the burlap is genius!